Your Instructor: "King of Pain" John F.D. Taff, author of over 90+ short stories and 5 novels. As REM said, everybody hurts. So how do you, as a writer, use your pain for fun and profit? How do you, as Hemingway said, sit down at a typewriter and bleed? And how do you do this without alienating readers? Translate the things that mean the most in your life into fiction with an edge. Employ emotional writing to give your work a ring of truth. Unlock your story's flow and direction with an emotional through-line. Stay true to your pain without triggering readers. This class will feature written lectures and writing exercises that will be critiqued by your fellow classmates and by John. So tear off those scabs, face your fears, and get ready to write! Avoid getting tripped up in the lure of memory & nostalgia. Emotion doesn’t have to be all anger or hurt. Learn that everything is a love story. Write your story as you remember it. The importance of character amalgams. Pick at the wound without bleeding out. Merge your pain with a story idea. Make your progress easier with emotional shorthand. Avoid letting the pain get in the way of story. Completing the circle is cathartic to readers—and writers! Achieve emotional transference and make your story memorable. Write a harrowing, emotional piece of short horror fiction. Channel real emotions in your writing. Identify possible triggers for readers and learn how to soften them when necessary. Work with your instructor and your fellow students toward producing the best work possible. Leave class with a completely critiqued short story manuscript. —Richard Chizmar, publisher of Cemetery Dance magazine and author of Gwendy's Button Box and Widow's Point. 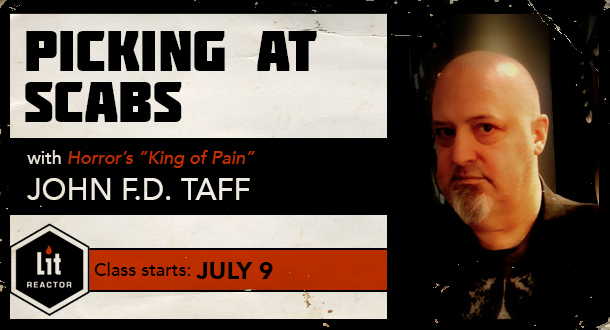 "John F. D. Taff has rapidly become one of my favorite writers in the horror genre. His stories vibrate with emotion and life and his prose is cathartic, deeply satisfying, like popping the bubbles in bubble wrap. And it’s just as addictive. Taff is not a genre star yet, but I predict he will be. He’s that good." — Ray Garton, Horror Grandmaster and author of Live Girls and Ravenous. "Often times with collections, I read them in spurts and take breaks in between. That wasn’t the case with Little Black Spots. This collection grabbed me right away and I found myself unable to put it down for long. The one thing that remains constant is Taff’s powerful and unique voice. All of these stories bear his signature style, but it finds him exploring that style and applying it in new and exciting ways. Taff strikes the perfect balance between genre fiction and literary and it makes for a haunting and intoxicating combination. Grab a copy of Little Black Spots and treat yourself to one of the year’s best horror collections." "Writers like John F.D. Taff don’t come around too often. For me, the man can do no wrong and this collection solidifies his standing as a must-read author of dark fiction. So, you want to read a high-quality short story collection from one of the best publishers in the business? Here you go, make sure you leave a lamp on." —Adrian Shotbolt, Grim Reader Reviews. "Mr. Taff always delivers the goods, whether writing long or short form fiction, and this is hands down the best single author collection I read all year."